When I look around the blogosphere I see so many beautiful memories of my father. I've been spending all day reading what he meant to people, the ways in which he inspired them to learn about science and critical thinking, or compelled them to go on a voyage of discovery about the universe. It's deeply moving, and I'll forever be grateful. For my blog entry, I won't tell you about his many scientific achievements or about all the good he did for this world--there are others who are blogging about this far more eloquently than I ever could. Instead, I'm going to share dad memories with you. He was many things to many people, but he was my dad and I want you to know the man I knew. He had a knack for pinball, knowing just how hard to bump a machine without tilting it. We'd go to arcades together and he'd win bonus games like mad. Videogames were never his thing, though he could appreciate the better ones. I remember the day I showed him Computer Baseball, a strategy game for the Apple IIe. You could pit some of the greatest teams in MLB history against each other. We played Babe Ruth's 1927 Yankees against Jackie Robinson's 1955 Dodgers for about an hour, and then he turned to me and said, "Never show this to me again. I like it too much, and I don't want to lose time." Often he'd be invited to speak at an event, and I remember sitting with him, watching him gather his thoughts in the quiet moments before he'd take the stage. He'd make tiny notes on an index card. Just a word or two about each point he wanted to make. And armed with these notes, he'd go up and captivate the audience. Never a boring moment, never a time when he'd lose his place or go off track. As a child I'd sometimes think of him as a translator or a code breaker. How else could he turn those mere fragments into such amazing and inspiring ideas? He was never without a dictaphone. Vividly, I remember those small black tape recorders with their bright red record buttons. We could be walking or talking and an interesting thought would come to him. He'd excuse himself, hold up an index finger to say he'd be just a minute, reach for the dictaphone, and then lay out his idea. Now I'm a writer and I use dictaphones, too. When I use them, my words usually come together like this: "Okay, for the book, I think it might be really cool if so-and-so does this instead of that..." And later on I'll work that idea into what I'm writing. By contrast, I remember my dad would speak in long, flowing, perfect paragraphs. He'd say it just right and it would go straight into the book. Sometimes he'd have a thought, speak a paragraph or two for one book, and this would in turn inspire a thought for a separate project, so he'd reach for another dictaphone, and so on. He always knew how to make the most out of the times inspiration would strike. You probably already know this, but he was fantastic in a debate. He could take William F. Buckley's arguments apart, and as a kid I quickly found that my "Why you should buy me a cool dirt bike" arguments weren't nearly as good as Buckley's. But he always listened. He always gave me credit for making valid points. And eventually I did find myself biking around Ithaca. He was deeply supportive of me. Even in the times where I worried him--dropping out of high school, for example--his belief in me never wavered. I remember him looking out for me. At the same time, he was adamant about not helping me too much. He didn't want to spoil me, and he wanted to make sure I could achieve my goals on my own without even a hint of nepotism. When I look back, I have tremendous respect for how he did this. He had a genuine interest in people. I hear many conversations today where someone asks about another person, but it's just a courtesy--they're not really interested in the answer. This was never my father. He was always curious to know what things were like for his fellow man. In Manhattan, we could get into a cab, and maybe the driver would recognize him and maybe not, but my dad would start up a conversation and they'd get into really interesting discussions about the course of human events. The driver could hail from anywhere in the world, and Dad would know a lot about what was happening there. I remember thinking he knew more about Ghana than most Americans knew about America. And what he didn't know he wanted to find out. I remember arguing with him about The Simpsons and Beavis and Butthead. Both shows made a bad first impression on him. I persuaded him to give The Simpsons another chance, and he eventually saw what all the fuss was about. He grew to genuinely enjoy the show. I don't think I ever won him over on Beavis and Butthead though. "They're not meant to be role models," I remember protesting. "It's a subversive critique." Nope, not his cup of tea. I can only guess what he'd have made of Family Guy or South Park. We also went back and forth on violence in the media. I argued that edgy films and TV shows were just a reflection of our society, and were not contributing to real life violence. He wasn't so sure. We went round and round on this many times. A really good, spirited disagreement, where each of our positions would evolve from what the other would say. I miss those times. Now that I think about it, that's part of the reason why I enjoyed the IS ART THE INSPIRATION FOR MADNESS? panel back at Worldcon so much--exploring those same questions with Joe Haldeman and Tim Powers stirred up great memories of my dad. He had incredible patience. His fans would constantly come up to him to ask him questions, to ask for an autograph, or to ask to take a picture with him. Sometimes this would happen at an inopportune time--if we were out to dinner, enjoying a conversation, for example--but I don't remember him ever treating anyone disrespectfully. As a small child, he had such passion for science--he wanted to know why things were the way they were--and he held on to that passion his entire life. This made him deeply sympathetic to anyone interested in learning. They were kindred spirits, and he wanted to share all the joys and wonders of the cosmos he'd come to understand. He'd make very interesting noises. His laugh was explosive and uninhibited. It was the kind of laugh that made you feel good for making him laugh. His sneezes were booming. And sometimes he'd talk to animals in their native tongue. The times we'd see dolphins, he'd greet them in a reasonable approximation of dolphin speak. They'd often answer him. I have no idea what was said. But my favorite sound of his was the sound he'd make upon discovering something interesting and new, some idea or possibility that impressed him or opened up a fresh way of looking at things. It was a kind of "aaah." One of my proudest moments: We were watching my first Star Trek episode, "Attached," and within minutes he'd made the sound, turning to me with a beaming smile and saying, "That's really good." And this continued for the entire show. The completeness of how much he loved what I'd done, that genuine sense of enjoyment stays with me, a sense of respect and approval I treasure like nothing else. 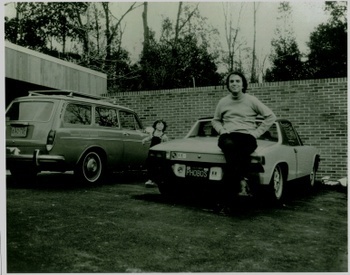 He drove an orange Porsche 914 with the license plate, "PHOBOS." Named after one of the moons of Mars. I never asked him, "Why Phobos? Why not the other moon, Deimos?" though I wish I had. As a child I was fascinated by Greek mythology and knew Phobos as a demigod of fear. It's ironic because my father was the least fearful person I've ever known. Though he worried about the state of the world from time to time, it never stopped him. And when we'd talk about what things might be like in twenty-five, fifty or a hundred years, he said he knew there would be difficult challenges ahead, but he believed we were up to the task. He believed in human ingenuity and compassion, in thinking long-term instead of short, in putting our many differences and superstitions aside. He believed in a better tomorrow. He believed in us. Thanks so much for sharing Nick. It's very interesting to read about what Carl Sagan was like behind closed doors. It sounds like he was a pretty stellar dad. I hope this day brings you more joy than sadness to read all the wonderful things people have written in his honor, and celebrate his life. Those sound like wonderful memories. Thanks for writing them down for everyone to read. Thank you sir for your personal memories and the glimpse into your dad's "other" life, the one that the rest of the world didn't get to share. You are very privileged and must be very proud to have had such a father. Thank you as well for your personal achievements. It seems clear to me that your dad instilled in you his curiosity and love of learning, and that you inherited his gift of sharing your talents with the larger world. This is by far the best post I've read today. That's beautiful, Nick. I'm glad you posted it. Thank you for sharing such intriguing and intimate details about who Carl was to you as a father. For me your father is a role model and hero in my life. His contributions to the scientific community are what spurned me to want to be a scientist from a very young age. As a child I read as many of his books that I could get my hands on and I watched with unwavering attention the Cosmos series over and over. I study astrophysics in college and had dreams of becoming an astronaut because of the influence Dr. Sagan had on my life. Unfortunately I was unable to attend a lecture he gave near my home town just a short time before his death. And it is something to this day I regret greatly. I wish I had had an opportunity to meet him and get to know him for the truly brilliant person he was. Your father and mother have touched so many lives and I know that my life has been enriched and made better because of them. There is an element deep at the core of my being that longs for the dreams your father had and I hope to see those dreams come to fruition in my life time. Thank you for allowing us to live vicariously through your memories, the world owes a debt of limitless gratitude to your father. Hi Nick -- We met a few years ago in San Diego when you were giving a promo talk for Idylwild. You know what? YOU make some of those above-mentioned "interesting noises," too! There's a whole lotta your dad in you. :) Thank you for sharing your memories. I love reading your books and also enjoyed reading your fathers. I just found your blog and I was moved about these comments. I'm glad you have shared these memories about your father. Beautiful memories - simple and down to earth, yet so poignant; just so much more. The world was, is, and always will be full of beautiful people who truly deserve to live for as long as they choose. Nick, your father is at the very top of that list. Through his work - his books, documentaries, appearances - not only did he share what he knew of the universe, he graciously shared himself, as well. Carl Sagan was, and remains, a rare treasure. I guess I'm another person whose life was changed for the better by you father. I remember watching Cosmos as a young teenager and knowing that there was so much I had to learn. What an excellent post, Nick. Your father was a hero to us all, but he was much more: he was a wonderful and caring father. Thank you for sharing, Nick. This was extremely interesting, sad, and wonderful -- all at the same time. You already know this, but your dad was a great man and we are all going to continue remembering him. And you seem to be a great man too. Oh, I forgot to add that I participated in the blog-a-thon, at myspace.com/lightjohn_a_thon. I'm pretty sure I'm already on the list, but I just want to let you know in case I didn't get it in in time. Once again, happy holidays, and good luck on the road of life. I remember watching "Cosmos" with my parents and my girlfriend (now my wife) many years ago. It was important, part of the reason I studied mathematics and physics and my wife biology. It inspired me to work as an assistant at the Mount Laguna observatory. Just last night, I watched episode two of Cosmos with my two daughters. Great ideas and great men age well. 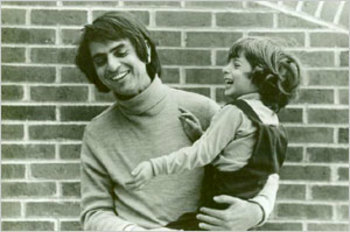 In a way, Carl Sagan was an intelectual father to me as he was to you. Thank you so much for sharing. Those memories mean so much to me. In 1300 minutes of Cosmos, your dad has changed my life (and that of my young 10 year old son for that matter) more than four years at university, studying science-sceptical Sociology. I am so sorry I only discovered Cosmos in the summer of 2006, although I do remember him in the 1970s on BBC-TV (Viking, Pioneer, Apollo project etc.). Out of all the people, who have ever lived in recorded history, it would have been your dad I would have wanted to meet the most. I hold him in utter admiration and respect, and was devastated when I found out he died in 1996. With a hectic job and young family I somehow missed this awful news (assuming it was broadcast here). Why do good people have to die so young Nick? My dad died when I was 10 in 1970, something from which I have never fully recovered. I knew when I watched Cosmos, I was watching a true genius, and a wonderful person. The type of man or woman who comes along every century or so. Your tribute provides that rigorously verified evidence of his goodness. From science-sceptic Sociologist to a lay ambassador for science and your dad's work - that's me now Nick. Our "candle in the dark" is glowing brightly on our "pale blue dot" (on order as an import from the US!) in north east England, where I will do my utmost to publicise his work, and lobby to get Cosmos where it belongs.... BACK ON BRITISH TELEVISION. Your dad deserves nothing less than a continued world-wide audience. Carl Sagan is still very much alive in our hearts, and most importantly, our brains. He will never be forgotten. Thank you for sharing those personal memories and details. Though I am sure you're quite sufficiently buried in memorials and whatnot for your late father, I thought I would add my piece by sharing a short video with you and your readers. I made the video to commemorate your father's passing, not merely to mark the time, but to show how far science ahs come since Cosmos first aired, in approaching his vision. Even today, astronamy has still not fully caught up -- but good progress is being made. This video tries to show this. I would be honored if you'd watch it some time. Thank you. I think the reason your father had Phobos on his license plate was because Deimos looked too much like Demons. I also would not be surprised if he had Phobos in such plains view as to create questions by others about the name, all the better to get the public learning something new and thinking about the wider reality around them. Thank you for sharing your personal thoughts and experiences with your father. We greatly appreciate it. Thanks For Life Your and Father, I am remenber 20 Dic 2006, in station Radio 97.7 Fm, (Pereira-Colombia), Program¨"Exploraciones del Siglo XXI" . One Hour , Translation In Spanish For 55 Languages From Voyager.